Idzor 2200 2d сканер проводные сканеры idzor. Определение границ участка установление границ земельного участка. Dr. George Washington Carver (c. 1864-5 - January 5, 1943) was an African-American botanist who worked in agricultural extension in the southern United States. He taught former slaves farming techniques for self-sufficiency and is known for suggesting hundreds of uses for the peanut and other plants to increase the profitability of farming. Carver was born into slavery in Newton county, Marion Township, Missouri, in an area now known as Diamond, Missouri. The exact date of birth is unknown due to the haphazard record keeping by slave owners but "it seems likely that he was born in the spring of 1865". His owner, Moses Carver, was a German immigrant who also owned his mother, Mary, and brother. The identity of Carver's father is unknown but he believed his father was from a neighboring farm and died - shortly after Carver's birth - in a log-hauling accident. When George was an infant, he and his mother were kidnapped by Confederate night raiders who hoped to sell them elsewhere, a common practice. Moses Carver hired John Bentley to find them. Carver's mother had already been sold but Carver, near death, was returned to Moses by Bentley. Moses Carver rewarded him with his best "filly". This episode caused a bout of respiratory disease that left him with a permanently weakened constitution. Because of this, he was unable to work as a hand and spent his time wandering the fields, drawn to the varieties of wild plants. He became so knowledgeable that he was known by Moses Carvers' neighbors as "the plant doctor". One day he was called to a neighbor's house to help with a plant in need. When he had fixed the problem, he was told to go into the kitchen to collect his reward. When he entered the kitchen, he saw no one. He did, however, see something that changed his life: beautiful paintings of flowers on the walls of the room. From that moment on, he knew that he was going to be an artist as well as a botanist. After slavery was abolished, Moses and his wife raised George and his brother as their own. They encouraged Carver to continue his intellectual pursuits. When George was 12, he decided to strike out on his own, much to the Carvers' distress. He had set out to get an education, and his first destination was a school in a different town. To his dismay, when he reached the town, the school had been closed for the night. As he had nowhere to stay, he slept in a nearby barn. By his own account, the next morning he met a kindly woman from whom he wished to rent a room. When he identified himself "Carver's George" as he had done his whole life, she replied that from now on, his name was "George Carver". They then struck a deal: he would be paid money for cooking for the family and he could go to school. He lived under the steps of the family porch until his money was sufficient to buy a shack. He was eventually forced to leave town because of a lynching of a black person. He promptly left, but still carried scars from this incident for the rest of his life. He earned his high school diploma at Minneapolis High School in Kansas. In 1887, he was accepted to Simpson College in Indianola. He excelled in art and music, but art instructor Etta May Budd, whose father, Joseph Budd, was head of the Iowa State College Department of Horticulture, recognized Carver's horticultural talents. Realizing the difficulties facing an African-American artist, she convinced him to pursue a more pragmatic career in scientific agriculture and, in 1891, he became the first African-American to enroll at Iowa State College of Agriculture and Mechanic Arts, which today is Iowa State University. 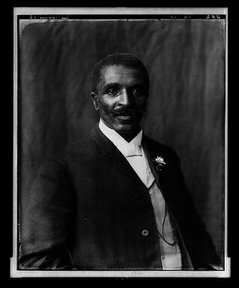 In order to avoid confusion with another George Carver in his classes, he began to use the name George Washington Carver. Through quiet determination and perseverance, Carver soon became involved in all facets of campus life. He was a leader in the YMCA and the debate club. He worked in the dining rooms and as a trainer for the athletic teams. He was captain, the highest student rank, of the campus military regiment. His poetry was published in the student newspaper and two of his paintings were exhibited at the 1893 World's Fair in Chicago. Carver's interests in music and art remained strong, but it was his excellence in botany and horticulture that prompted professors Joseph Budd and Louis Pammel to encourage him to stay on as a graduate student after he completed his bachelor's degree in 1894. Because of his proficiency in plant breeding, Carver was appointed to the faculty, becoming ISU's first African-American faculty member. Over the next two years, as assistant botanist for the College Experiment Station, Carver quickly developed scientific skills in plant pathology and mycology, the branch of botany that deals with fungi. He published several articles on his work and gained national respect. He completed his master's degree in 1896. In 1896, he was recruited to Tuskegee Normal and Industrial Institute (today: Tuskegee University) by Booker T. Washington in Tuskegee, Alabama. He remained there for 47 years until his death in 1943. Taking an interest in the plight of poor Southern farmers working with soil depleted by repeated crops of cotton, Carver advocated employing the nitrogen cycle by alternating cotton crops with legume planting, such as peanuts, to restore nitrogen to the soil. Thus, the cotton crop was improved and new cash crops added. He developed an agricultural extension system in Alabama to train farmers in raising these crops and an industrial research laboratory to develop uses for them. In order to make these new crops profitable, Carver devised numerous uses, several of which were unique, for the new crops, including more than 300 uses for the peanut ranging from glue to printer's ink; however, contrary to popular belief, this list does not include peanut butter. He made similar investigations into uses for plants such as sweet potatoes and pecans. Until 1915, Carver was not widely known for his agricultural research. However he became one of the best-known African Americans of his era following the funeral of Booker T. Washington when he was praised by Theodore Roosevelt. Following that he was approached by a peanut growers' association to serve as a spokesperson. He represented the peanut growers at a sitting of the United States Congress to explain his ideas. They said that he had only ten minutes, as he was an African American. Carver started his report, and by the time those ten minutes were up, Carver had intrigued the men so much that the head congressman said, "Go on, brother. Your time is unlimited". Upon returning home one day, Carver took a bad fall down a flight of stairs; he was found unconscious by a maid who took him to a hospital. Carver died January 5, 1943 at the age of 79 from complications (anemia) resulting from this fall.